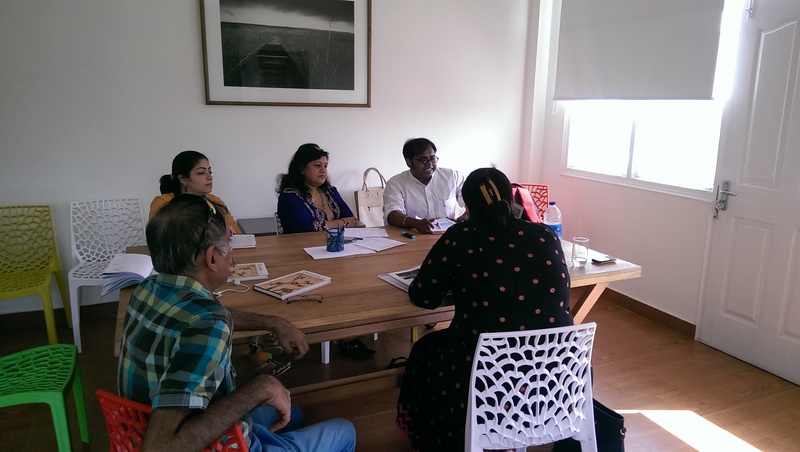 Our Open Minds Book Club session saw the concluding session with Benodebehari Mukherjee’s ‘Chitrakar’ The Artist being discussed at the Art1st studio in Lado Sarai, Delhi. Art historian Rahul Dev facilitated the session hinging the discussion through fascinating and poignant phases in the life of the artist. Chitrakar the book maps out essays written by Benodebehari Mukherjee over the course of his artistic life. He had written few pieces for a Bengali literary journal but avid readers of the same wanted them published as a book. The book therefore, is about Mukherjee’s core philosophy and his approach towards his calling as an artist. The works were penned by the artist while he was grappling with blindness. Employing a largely autobiographical approach, the first essay titled ‘Chitrakar’ spans across his childhood, apprenticeship, maturity and finally his encounter with blindness. The second piece ‘Kattamashai’ is his account of himself bracing with blindness while also balancing his creative equation with life, he posits this essay on the ego and identity battles that he waged within himself. The third write-up called ‘Kirtikar’ is more of an analogy on the unwarranted need to reach for the stars while creating missing links between the ‘ends and the roots’. The last one called ‘Silpa Jignasa’ delves deep on his take on art and its various components that contribute to the ‘whole’. 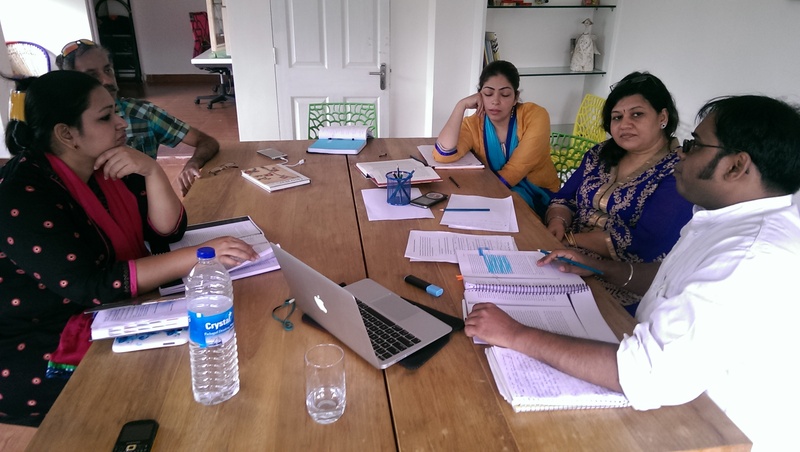 The discussion was contextualized by our facilitator who gave it a pertinent backdrop by bringing into focus the rural retreat that the artist found in Santiniketan, much like the others of the Bengal School. Themes that defined his artistic journey like his association with Kala Bhavan, his alliance with Japanese artists and art techniques were discussed. 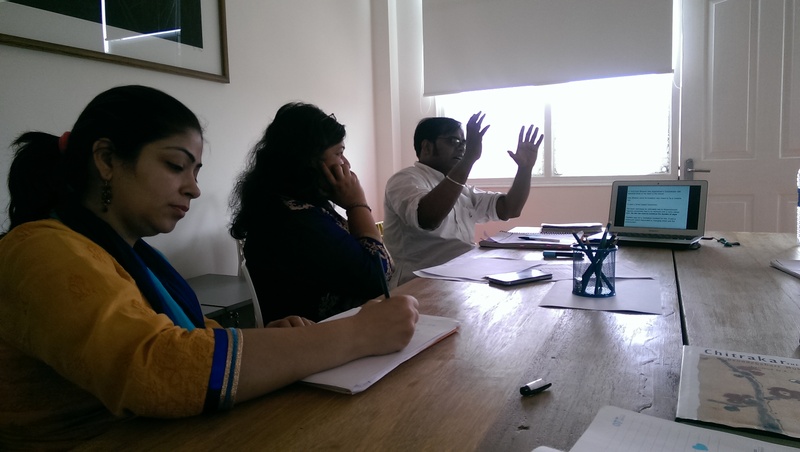 The session took upon questions that underscored the ‘burden of style’ that Benodebehari grappled with. Also, the thrust on his ‘world of light’ and ‘world of darkness’ as recurring phrases in the book were tabled for further deliberations. His inner and very personal connection with the philosophy of Taoism, was also highlighted by our facilitator further explaining the nature of his work, linking it up with the strong bearing Santiniketan had on his person. Some of his works were also discussed in great detail again highlighting the quality of ‘timelessness’ that his works exude. Sarika Khurana from Sanskriti School, stated that “It is not so much about the treatment of media here as it is what and how he captured with his own vision”. The session drew to a close with a screening of “The Inner Eye” (1972) a short documentary film on Benodebehari Mukherjee directed by Satyajit Ray to put into perspective the manner in which the artist’s inner eye steers his hands towards ‘creating’, which the participants partook of and assimilated well. Previous Dr. Seuss’s wise words….